Remember me telling you about Curated Quilts, the new quarterly quilting journal coming out soon? 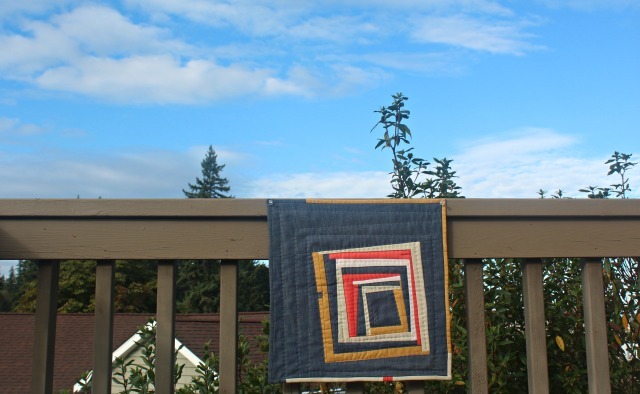 Well one of the features in each issue is a mini quilt challenge. For the second issue, the call for log cabin quilts has been announced. In fact, the deadline is coming soon - October 1! I can't honestly say that what I'm submitting is quite the result I may have gone after if it hadn't been for the traveling I've done the last several days. Ie. I knew I'd be away from my machine for a while, and the week waiting for me when I returned didn't guarantee much sewing time either. So when I managed to get a quilt top done before I left, I knew the only logical way to proceed was with hand-quilting. Which is all fine and good. I've had plenty of experience at it back in the day, but lately not so much. And with the use of both Art Gallery denim and Essex linen in the piece, the thickness varied quite alot, and my stitches were kind of wobbly and uneven. You know - a very handmade look. The best part, though, was the thread I used - Aurifil 28wt #2625 (Arctic Ice). It was a first for me, as far as hand-quilting goes, and it stitched oh-so-smooth. By the way, the backing I'd found in my stash was pretty perfect, I thought. In person, the colors really mesh with those of the required palette. Which reminds me - there was a required palette! What I saw in the photo posted was gray, tan, coral, gold, and pink. I read somewhere that the gray was really 'a soft navy', which is why I chose the denim. At any rate, it was a really captivating palette for me, and very enjoyable to work with. One other little issue, though, was that I took the opportunity to use a machine I was quite unfamiliar with to sew on the binding. Don't get me wrong - it was a delight having a brief sewing spell in a borrowed (with permission!) sewing room, but it was kind of like sewing in Greek - none of the buttons were familiar, and I wasn't about to switch out the walking foot, thus my seam allowances weren't as precise as normal, and that resulted in a bit of bunching in the finished binding. In an odd sort of way, maybe that just adds to the wonky log cabin and the imperfect quilting, eh? Whatever, it was a very enjoyable sew and gave me some hand-stitching for the car ride. 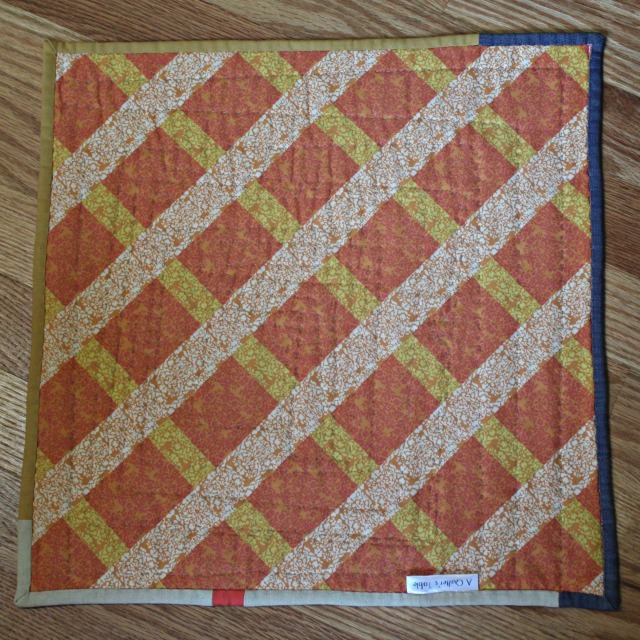 Finishing at 15" square, it's the smallest quilt I've made in a while, and I confess, that was a bonus. Perfect it's not, but who ever said it all had to be? ....Exactly. 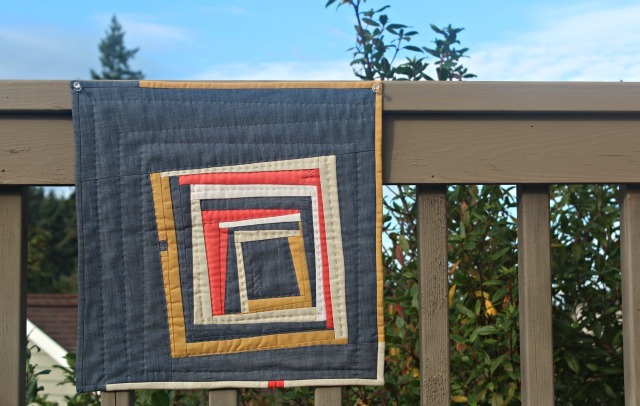 Linking up with Curated Quilts' Call for Entries - Log Cabin Mini Quilt. it's wonderful! and as always, your photography is perfect. That first pic especially makes the quilt look much better. I love it. good work! I think the hand touches do give it character; it certainly might be a small quilt but it will pack a lot of memory for you in its story! I guess the beauty of a log cabin block for me is in the stories and rings and layers created by and represented by it, really. I think it is perfect. It's a log cabin and you have underlined that in an attractive way. Inspiring as always and I agree, 'perfect' photography. Your photography is perfect for the quilt. It's a fun design with a nice back story of its creation. I love this it turned out so good! Love the denim background you've used. Nice work as usual! Great design! 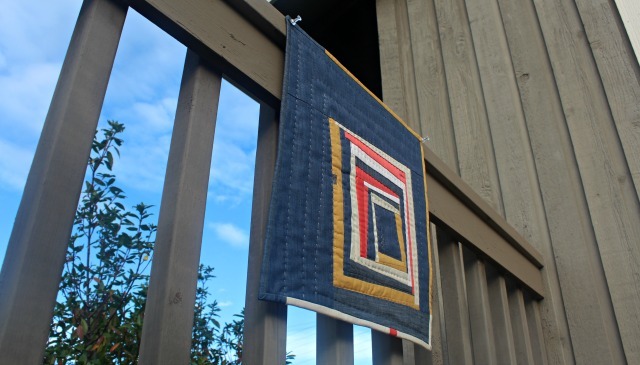 I love the denim background and the hand quilting, such great texture! The palette is beautiful and the design very interesting! I absolutely love it, with all its imperfections, if any. I agree, it doesn´t have to be perfect, after all it is hand made, BUT it looks a lot like perfection to me! This mini is so good! Mine wasn't chosen either. I can't wait to see which ones were chosen there were some pretty creative minis submitted. Love the colours & improv design! I must give myself time to play & mini quilts seem to be such a great size to test out thoughts on colours & patterns. I love this little quilt. Everything about it speaks to me.